Two teams of European climbers have put up a pair of traditionally protected ice and mixed climbs in the Alps this winter. 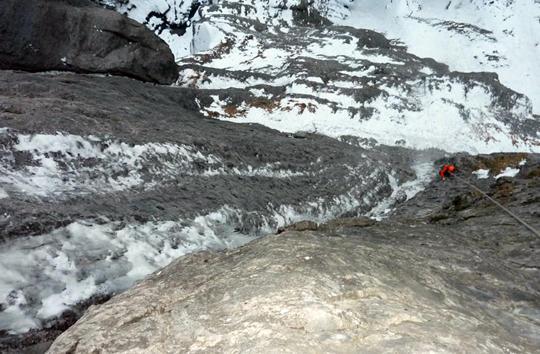 In December, Germans Robert Jasper and Wolfram Liebich established The Black Death, a 250-meter line with a WI7 M8 difficulty in Switzerland's Kandersteg. 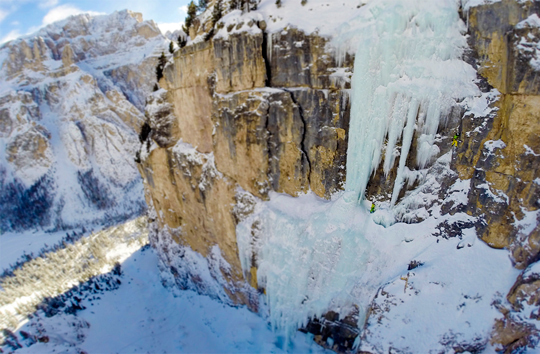 Late last month, a second WI7 went up in the Dolomites, courtesy of Albert Leichtfried and Benedikt Purner. Jasper had been eyeing the route when walking up to Ueschenen, a mixed climbing spot of world-renown, in the Bernese Oberland. "Every time I thought I have to wait for better conditions and more ice especially because of the horrible, brittle rock there," he wrote in an email. "This year I thought it's time for a try. The rock was really brittle but we found enough ice, and we climbed four pitches, then it got dark and we had to rappel down." 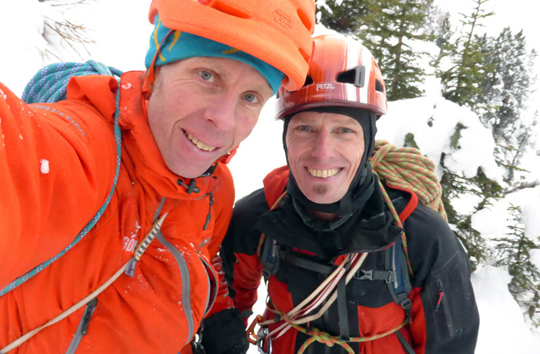 Five days later Jasper and Liebich returned and completed the route, and its fifth pitch, in eight hours. "It was a real great adventure in this kind of rock, with thin ice and bad protection, a real alpine climb!" Jasper said. 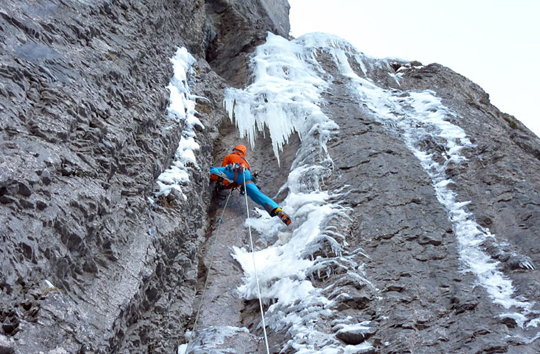 An early pioneer of ice and mixed climbing in the Kandersteg area, including the first ascent of Monty Python and the Holy Grail (WI5 M12, 165m) on the Breitwangflue wall a year ago, Jasper has watched an expansion of route quantity and style through the decades. "Today," Jasper continued," you can find many lines from sport-mixed to multipitch climbing and from bolted lines to trad style." Due to the psychological nature of the climb and the friable nature of the stone, Jasper also added a risk level of E5. Much like the British use of the E-grading scale Jasper's E-scale takes into account the danger of injury, quality of protection and the psychological demand of the climb. Each tenant has three levels, and each proceeding level is one point more than the last, starting with one. The first level, E1, would therefore have three points: one for good protection, one for low potential for injury and one for no psychological demands. The grade level E5 meant Jasper awarded the climb eight of nine maximum points. "In order to climb [The Black Death] you need lots of experience at placing trad gear, and you need to climb with a 100-percent safety margin," Liebich told planetmountain.com. "Not easy on thin ice and friable rock. Climbing this route in trad style, without bolts, was a great alpine adventure. Which all leads me to believe that The Black Death is currently one of the most demanding climbs in all of Kandersteg." 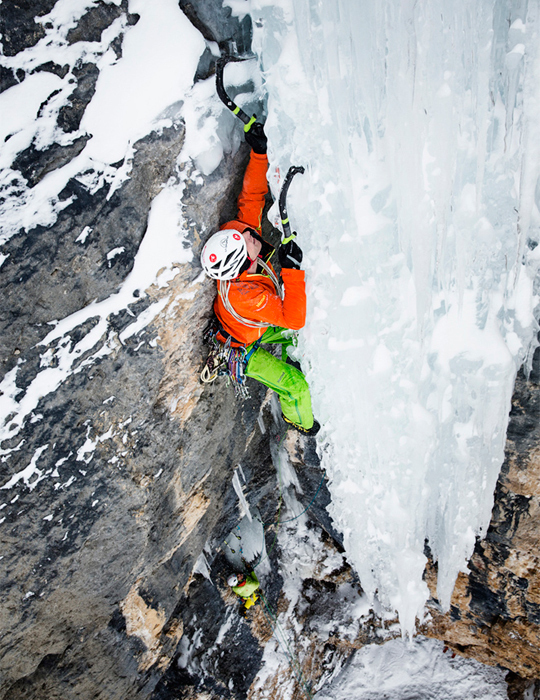 Leichtfried and Purner also paid close attention to style on their onsight first ascent of Zweite Geige (WI7 M7, 140m) on January 28 in the Langental area of Vallunga, a broad glacial valley in South Tyrol, Italy. They climbed the route clean, placing only ice screws and cams and leaving no fixed protection behind. Before starting up the wall, they sacrificed their fresh legs by climbing and fixing a rope up an adjacent WI6 M9 for their photographer, Elias Holznecht. 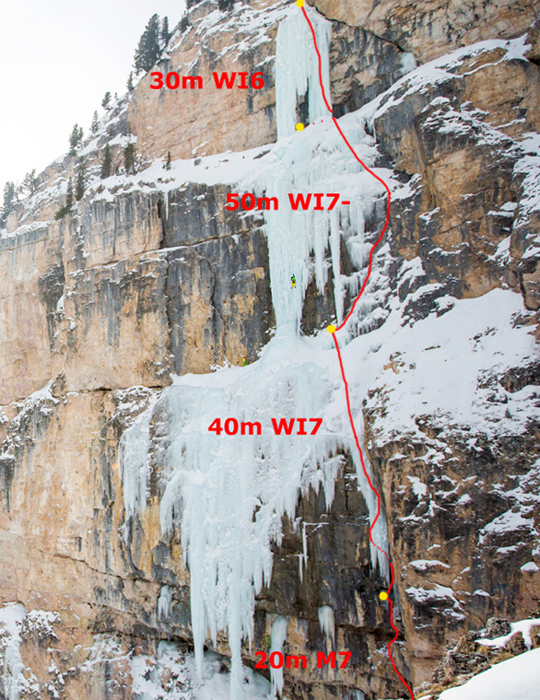 Purner lead the first pitch of Zweite Geige soon after, climbing through a short, awkward corner made of poor rock. His belay below an icicle set Leichtfried up for a "quite demanding" sequence of free-hanging ice features "with many air inlays and pipes," he wrote in his trip report. "[Y]ou had to think of every moment not to destroy the hanging ice dagger." Terraces of thin WI7- ice brought the Purner to a final pillar that Leichtfried led to complete the four-pitch climb. "You have to search for new challenges," wrote Leichtfried. "Ice climbing lives in the moment.... [Y]ou cannot wait that [new routes] would come to you, neither can you plan them."